Inter coach Walter Mazzarri praised his side for breaking down a sturdy Stjarnan in Iceland on Wednesday. The Serie A side travelled to Reykjavik for the first leg of their UEFA Europa League play-off, and were 3-0 winners courtesy of goals to Mauro Icardi, Dodo and Danilo D’Ambrosio. Mazzarri’s men could not find a breakthrough until the 41st minute though, when Dodo’s cross into the area eventually fell to Icardi who finished. The former Napoli boss hailed his men for remaining patient at the Laugardalsvollur, as they shot clear via goals either side of the break to Icardi and Dodo before D’Ambrosio’s late effort. 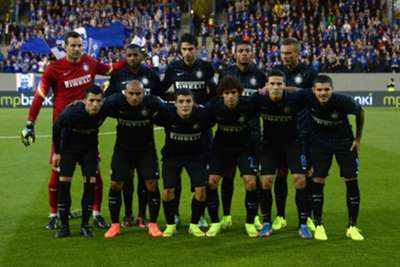 “It was good that we managed to break the deadlock,” Mazzarri told Inter Channel. “It wasn’t easy at the start because they got men behind the ball and battened down the hatches, waiting to strike on the counter. “We were smart enough to bide our time and wait for the goal to come. “Getting the second straight after the restart was important too, and it came following a nicely worked move. “Up until that point we were very careful in making sure we weren’t caught on the counter-attack. Mazzarri also spoke highly of midfielders Hernanes and Mateo Kovacic, claiming the pair were finding their feet as Inter generals. “Hernanes did pretty well. He’s improving, as all the players are,” he said. “He and Mateo played well tonight, because they had to work both defend and attack.